It’s that time of year for me again. Time to start raising chicks so that we’ll be rolling in eggs come June. The last few months have had a lot of ups and downs with my laying hens. I usually start a new batch of chicks towards the end of the summer. If I start in early August then I’ve got a good chance of having eggs by February. And the late summer start is really beneficial to the fragile little chicks that need the warmth so they don’t become stressed. We start our chicks off in large brooder boxes that my husband built. Very sturdy, heavy lids so I don’t need to worry about wind flipping them open, or a marauding raccoon coming in for a late night snack. 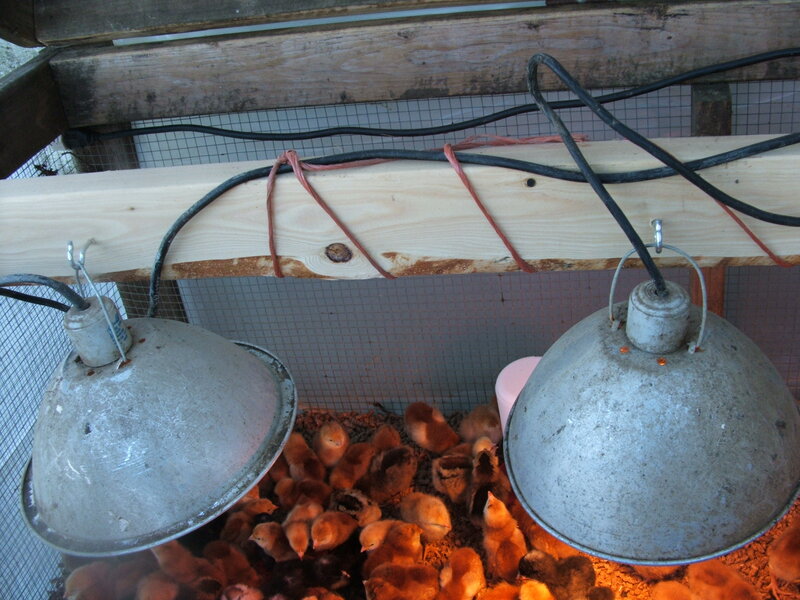 Starting chicks in the summertime, a few heat lamps suspended above is all I need for warmth. As the chicks grow and begin to feather out, the lights only come on in the evening. And the boxes are plumbed with automatic watering bowls to make that chore even easier. Then, as they grow I’m able to move them out to a larger area adjacent to the older hens. Eventually the older hens which have slowed down in egg laying will be culled for the stew pot and the young pullets will take their place. Easy peasy. Settling in. 150 mixed chicks. But, things haven’t been so easy peasy getting this latest batch settled in. First, the original batch of replacement layers that I had ordered back in August were picked up at my post office by a different farmer. It’s a long, sordid story and ended with me waiting for a replacement batch to arrive at the end of September. The Barred Rocks were on back order with my favorite hatchery and I wasn’t willing to take a different breed. Part of my chicken management involves switching between breeds with every new batch. That’s the easiest way for me to know on sight the age of my hens. An important piece of information to have when you are determining which chickens have another season on the farm and which ones are due for harvesting. By starting the last batch of Barred Rocks at the end of September, I had completely thrown off my schedule. By the time the chicks were fully feathered out and ready to move to their next location, we were on the verge of experiencing a weather extreme at the farm. Freezing temperatures, cold wind, frozen and subsequently broken water lines etc. Unfortunately their new home was not set up to handle those conditions. Remember, we were running almost two months behind schedule. That’s a lot of time in chick development. So I did the best I could to keep them comfy during that time period. In the end we had 3 surviving pullets out of the original 100. Things were pretty dismal. I was faced with cutting my losses and having no eggs of our own for the coming season. But that just wasn’t going to work. I’ve been spoiled with my own eggs for the past five years or so and in my opinion, nothing compares to an egg fresh from the “backyard”. And we sell eggs to a loyal customer base that has been suffering withdrawal right along with us. So it was time to jump back in to the chicks again. Fast forward to the end of January. It pushes my egg start out to mid-June, but at least we’d have our own eggs. My husband had to make some modifications to our brooder boxes to keep the heat in for the chicks. He stapled plastic and a type of insulation around the outside of the boxes and across the lids. This would work to keep heat from the lamps inside the boxes instead of seeping out. The chicks arrived and I got them all settled in. But I wasn’t happy with the temperature in the boxes, still a bit cool. I added 3 bags of bedding to keep the heat trapped inside. Almost there. Then I lowered the heat lamps off the hooks and just twisted the wire around the top of the frame so that the lamps were closer to the chicks. Perfect. The chicks settled in, spread out and quieted down. A sure sign that things were well in chick-ville. Noisy, bunched up chicks are an indication of too cold temps. I went out to milk the cows and daydreamed of cracking open my first egg later this summer. About an hour later I became aware of smoke in the air. Not at all unpleasant, kind of like a campfire. Around here lots of people are burning wood stoves for heat, or just burning “stuff” outside. More daydreaming about summer, camping…then as I headed up towards the house I saw some pretty thick smoke that was too close to my house…maybe I’d better go check on those chicks. The chick house was on fire. Or at least smoldering heavily. I threw open the lid and inhaled entirely too much toxic smoke. The chicks were going berserk. I dumped out their water jugs to put out the “fire”, unplugging the heat lamps at the same time. Then waited for the smoke to clear. The chicks appeared to be fine. I guess being so low to the ground they weren’t as affected by the smoke as I was reaching down into it. Apparently one of the heat lamps that I had “rigged” up to provide a closer source of heat had slipped out of the loop that I made and was nestled on the bedding. 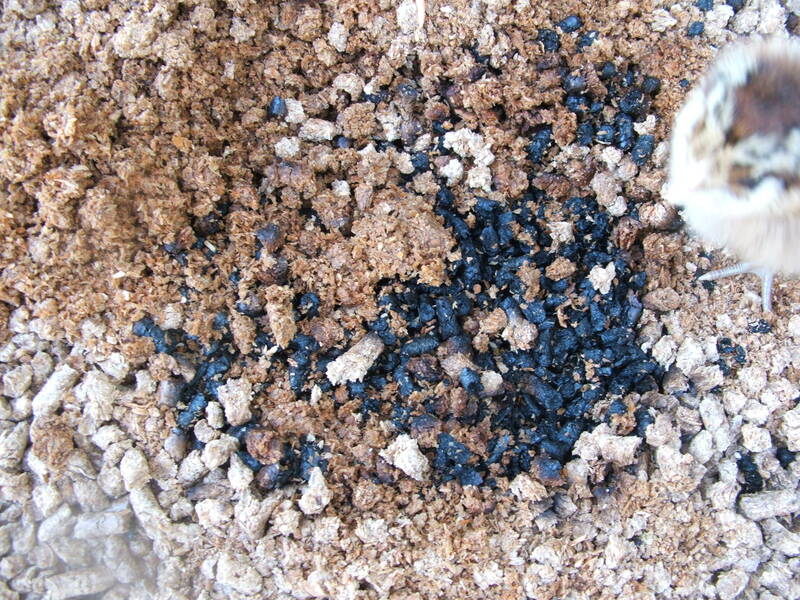 The heat from the bulb caused the bedding to ignite. No one has to tell me just how lucky I (and the chicks) am that I caught it when I did. Surely it would have killed every chick and no doubt spread to my house. The brooder boxes were recently moved to within feet of my house, under a window so I could keep an eye on the boxes during the night. We always hear about barn fires from overturned heaters or even from heat lamps like I was using. If you use a source of heat like this- and all of us who raise livestock do at one time or another- please, please be careful. I never should have hung those lamps the way that I did. No matter that I’ve been doing it like that for many, many years. My chicks are rehoused, bedding swapped out and heat lamps are appropriately secured. I’ll tell you what- that first egg when it finally gets here is going to be the best egg ever. The most expensive, anxiety inducing,stress producing egg I will ever have eaten- but totally worth it. 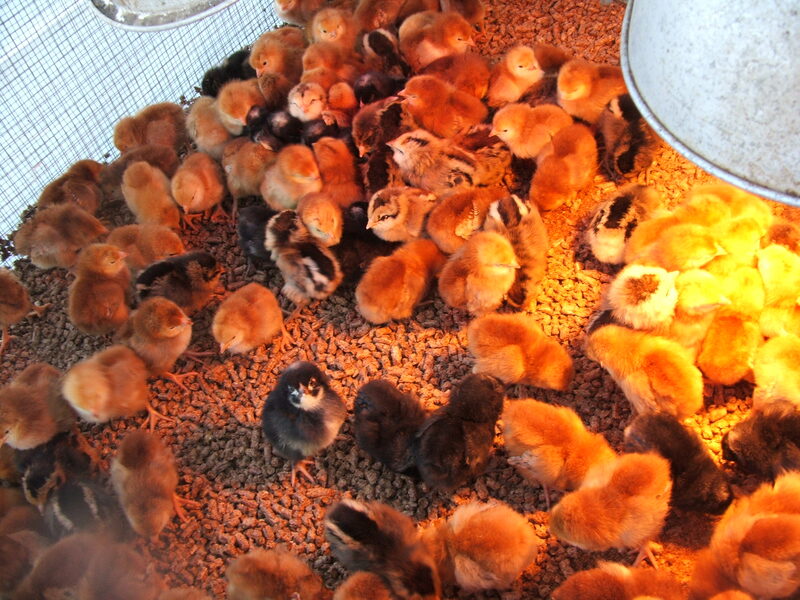 This entry was posted in Uncategorized and tagged barn fire, chicks, heat lamps. Bookmark the permalink. Wow! Homesteading ain’t for sissies 😉 Glad everyone feathered & otherwise is ok! Keep up your hard work……Farms are gonna save our crazy world one day! besides i love living vicariously through you awesome Farmers! Start your journey to natural living and a sustainable lifestyle with Ready Nutrition. Find regularly updated tips, ideas and strategies for better health, a happy home and a prepared family.